Now, buying a new car, truck or van can be easier than ever, without the guesswork or the stress of haggling with a dealer. 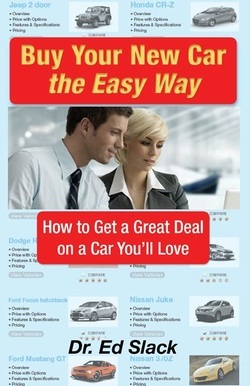 Our easy to use step by step guide, Buy Your New Car the Easy Way: How to get a Great Deal on a Car You’ll Love, will save you time, money and headaches, guaranteed. If You don't save at least $1000.00 using this book, return it within 30 days for a full refund, (print version only). Print Version: $19.95 - Digital Version: Only $14.95 - Free Shipping for a limited time! @copyright 2011, Dr. Ed Slack & Simple Truth Publishing. All Righth Reserved.